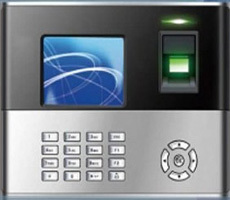 U990 is an innovative biometric fingerprint reader for Access Control and Time Attendance applications, offering unparalleled performance using an advanced algorithm verson 10.00 for reliability, precision and excellent matching speed. access control connectivity for Wigand-in, Wigand-out, Door lock connection.It comes standard with TCP/IP, RS-232/485, USB-client. Internal Camera and Photo-ID support the user's photo display and make T & A application more visible and reliable. Stores up to 3,000 templates and 100,000 records. Monitor employee's movement at any time. Provide extra security with 50 time zone, user grouping, and professional unlocking combination function, easy integration with door lock system.